The Manipur University Research Club organized one day workshop on Application of Computer in Research on 22nd December 2018 at the Department of Computer Science, Manipur University. Centre for Myanmar Studies, Manipur University organized interactive session with State Constitution Coordinating Body (Myanmar) on Borderland and Governance: North East India and Myanmar at the Court Hall of the Manipur University. The inaugural function was graced by Prof. W.Vishwanath, Vice Chancellor(i/c), Manipur University as Chief Guest, Prof. N.Lokendra Singh, Director, Centre for Myanmar Studies, Manipur University as President and Dr.SaiOo, Director, Pyidaungsu Institute, Myanmar as Guest of Honours. The welcome address was presented by Prof. MC Arunkumar, Program Coordinator, Centre for Myanmar Studies, MU. The function have 65 active participants along with 33 Myanmar Delegates. Manipur University Cultural Committee, Manipur University have organised the 'XXXII Manipur Univerity Inter College Youth Festival 2018' with the theme "Change for a bright Future". The XXXII MUINYF 2018 was inaugurated on 28th November 2018 at Centenary Hall MU Campus Canchipur by renowned filmmaker Aribam Syam Sharma (Padmashree Awardee), Jarnail Singh (Administrator, MU), Prof Ch Yashawanta Singh (Dean of Students' Welfare MU) and Mayanglambam Dayaman Singh (president MUSU) as chief guest, president and guest of honour respectively. 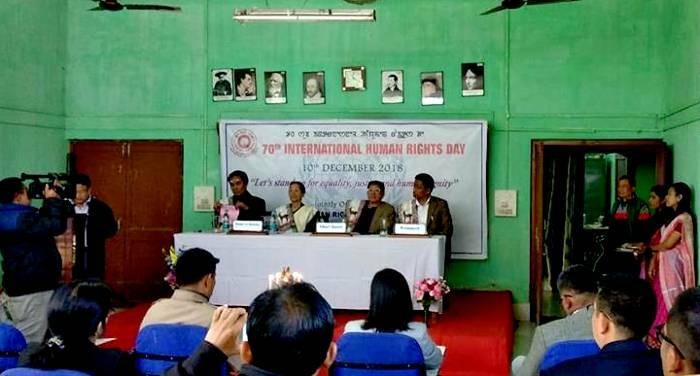 Manipur University observed 70th International Human Rights Day, with the theme "Let's stand up for equality, justice and human dignity". The observation was jointly organized by Centre for Human Rights & Duties Education and Department of Law. “Two-Day Workshop on Indo-Myanmar Cross Border Relations and Interactions: Past, Present and Future” was inaugurated today in the Conference Hall of Hotel Imphal at 12.30 P.M., organised by OKD Institute of Social Change and Development, Guwahati, in collaboration with Centre for Study of Social Exclusion and Inclusive Policy, Manipur University and Sasakawa Peace Foundation,Japan. The 127th Birth Anniversary of Baba Saheb Ambedkar was observed today at the Court Hall of the Manipur University. The observance was organised by The Centre for Study of Social Exclusion and Inclusive Policy (CSSEIP), Manipur University. It is the 2nd observance of Ambedkar’s Birth anniversary being organised by the CSSEIP at the Manipur University.